Bell AH-1W SuperCobra - 1/48 - LANÇAMENTO! When the Bell AH-1 was delivered in the mid-1960s, it was the first pure attack helicopter (AH = Attack Helicopter) in the world. The helicopter stood out with its very slender fuselage giving it only a very small frontal target area for enemy fire. This mode of construction however dictated that in the cockpit the pilots (rear seat) be stepped up in order for him to see over the gunner (front seat). 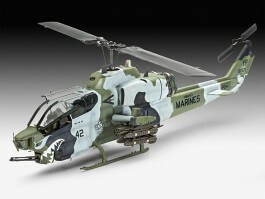 To comply with requirements of the US Marine Corps the helicopter received two engines enabling it to cover long distances safely, additional armament in the nose and wing pylons capable of carrying various weapons systems. The end result of further modifications culminated in the Bell AH-1W SuperCobra, that completed its maiden flight in 1983. In relation to its size the Cobra delivers a lot of fire-power. The aircraft has reinforced doors and belly panels to withstand small arms fire. The AH-1W is a battle-hardened and reliable weapon system and will therefore still be in use for many years to come by many countries around the world.